When the time comes to take care of you day's catch, we have excellent facilities for cleaning and processing your fish. Our expert staff will show you exactly what to do and assist when possible. You can prepare skin-on whole fillets for the grill, or take them home whole. 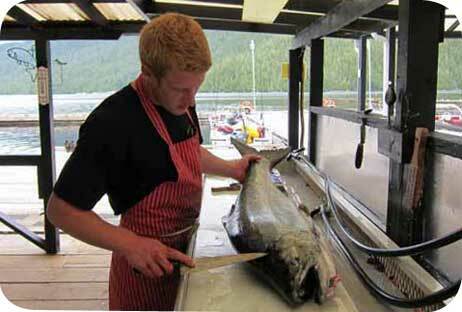 Our all-inclusive guests enjoy complete fish processing services. For our standard package guests, we are always available to help where we can. Black Gold is proud to be one of the very few Sports Fishing Lodges on the central coast of B.C. to hold a U.N. Certification License. This is due to the cleanliness of our processing program. After each day’s catch has been cleaned and packed, it is moved to our walk-in flash freezer, and then packed in airline-approved containers for your trip home. For guests traveling overseas (or exceptionally long distances), we use special insulated packaging that extends the duration of the frozen state.